into a simple, uncluttered form. We turn beautiful designs into a moving, living and highly functional websites. 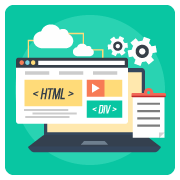 Each website is designed to suit the needs of our clients. Stand out from the crowd with our design and branding services. We cater to both small and large buinesses, providing design for a wide range of media. 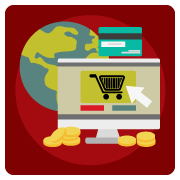 eCommerce websites are becoming the primary way of transacting business. We have had success creating both simplistic and more complex e-commerce solutions. Collage Media is a creative collaboration that works. 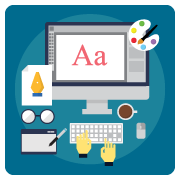 The combination of a creative web expert with a creative print designer means that we can provide the most effective designs that will work as effectively on both platforms. Whether it is a new or an existing but not-performing website, your new business that needs a branding or marketing materials we will work with you to maximise your effort, reach your target audience and make the best impact. We're based in Tralee, Co. Kerry & Mallow, Co. Cork. Collage Creative have completed several projects for me over the last four years and I will continue to work with them for some time to come. They have designed a range of products for me, from children's books to logos and business cards and I have always found them very easy to deal with. They provide an efficient and professional service and they're certainly talented designers.